The College of Arts & Sciences has identified four priorities for the current academic year: raising the profile of the College; providing essential resources for new and existing academic programs; enhancing experiential learning opportunities; and developing a strategic plan for graduate programs. Raising the profile of the College continues to be the top priority. Although the College has excellent faculty with national and international scholarly reputations, who are also acknowledged by their students and peers as outstanding teachers and respected mentors, many individuals — both inside and outside of Saint Joseph’s — are unaware of their considerable accomplishments. Two steps towards raising the College’s profile have already been successfully implemented; a third is being actively pursued. Drs. 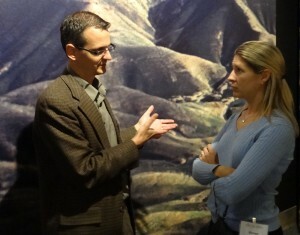 Bruce Wells and Aimee Terosky interact at the Dead Sea Scrolls event. First, we created Notes from the Barbelin Quad, which provides information about faculty and student accomplishments and College events; it is published four times during the year. Second, we hosted the first in a series of regular public events to showcase the expertise of the CAS faculty. On September 24 at the Franklin Institute, faculty from the Theology & Religious Studies Department guided alumni and members of the SJU community through an exhibit of the world-famous Dead Sea Scrolls. Third, Dean Madges is working with the Development Office in seeking a benefactor to name the College. The naming of the College would not only elevate recognition of the College, but also would create a substantial endowment, providing ongoing funds to strengthen current programs and spark the development of new academic initiatives. The second priority is to provide essential resources for new and existing academic programs. First and foremost, this means advancing the plan to hire more tenure-track faculty. Hiring additional tenure-track faculty will promote implementation of the General Education Program (GEP), improve course coverage by full-time faculty across the disciplines, and meet specific programmatic needs. Building upon the 17 tenure-track faculty who were hired for the 2012-13 academic year, Dean Madges has proposed a total of 15 tenure-track hires for academic year 2013-14. 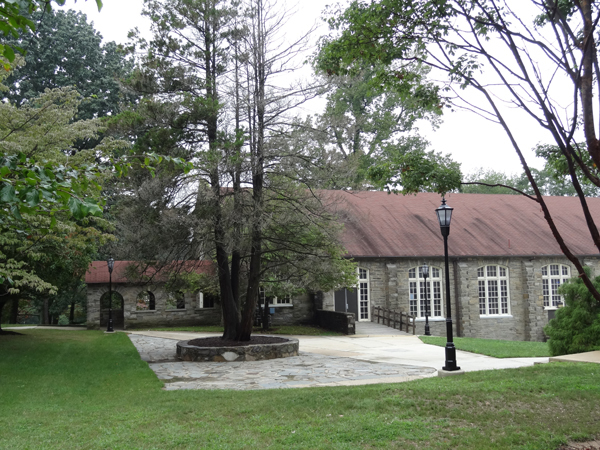 This second priority also entails providing new and renovated physical spaces for three of the newest CAS majors, Music, Theatre & Film Studies, and Communication Studies. The College Plan specifically envisions the renovation of Paris Auditorium on the Maguire Campus to include a recital hall, a black box theater, as well as rehearsal and office space. The Plan also calls for the creation of a second high-tech Communication Studies Lab. The third priority is to enhance experiential learning opportunities for both undergraduate and graduate students. We are working with members of the Advisory Board of the College and the New York Council to create greater internship opportunities for CAS majors. Other examples of experiential learning include fieldwork, study abroad, service-learning, and research outside of class. The fourth priority is to develop a strategic plan for graduate programs in the College. The strategic plan will involve the identification of graduate programs with growth potential, action steps to increase the number of international students, and the development of non-credit programs.